Why Isn't Rugby More Popular in the USA? I just watched a rugby tournament on one of the NBC network channels. Rugby is not on tv very often, but when it is, I usually watch it. I don't know much about the sport, but it is entertaining. 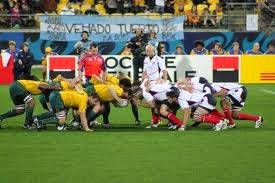 Rugby is basically a combination of American football, soccer, and a little bit of wrestling. These guys are more physical than football players and they don't even wear any pads! With the Superbowl happening today it got me thinking. The Superbowl is one of the most watched events. When you compare football and rugby, rugby seems to be a lot more entertaining. Comparatively, football is much slower. There is a lot more action in rugby. I think if Americans were more exposed to this sport and they learned the rules, this sport would pick up in popularity. Update 4-8-15 Rugby still does not get much coverage in the US at least not on the major networks, but a while back, they did have a special with the New Zealand All Blacks coming to the US for an exhibition game against the USA team. Of course the All Blacks one by a lot because they are one of the best teams in the world, but it was still fun to watch. Hopefully this sport gains some more popularity and we get to see more coverage soon! I agree, it's definitely more entertaining than gridiron (I refuse to call it football). The game is far more dynamic and spontaneous than football, especially since it is not broken up into single plays. Furthermore, you should probably note that gridiron is actually an offshoot of rugby - something that an Englishman such as myself will tell you all too gladly. I'm a junior rugby player in England and currently I'm preparing for my school's U-18 tour to the Pacific, in which we're playing a game in Los Angeles. Our coaches mentioned that it was pretty hard to find a proper youth team stateside, so eventually they settled with a team of Samoan expats based in LA. I found this pretty surprising. I mean, I was under no illusions that rugby was extremely popular in the US, especially compared to baseball or gridiron, but I assumed that there'd at least be a few school teams or something that we could get a hold of, especially in a big city like LA. This got me interested so I did a bit of research (if you can call it that) on the state of the US game, and honestly the answer wasn't all too exciting. Although it is gaining momentum on a grass-roots level, rugby is still very much a fringe sport, and this is largely down to funding. USA-Rugby (The US rugby board)is considerably poorer than the NBA, NFL, MLB and even the MLS. As such, it cannot advertise or promote itself nearly as freely - and given that it won't be watched by too many people, corporations aren't willing to advertise on their matches and TV stations aren't willing to show the games, thus creating a vicious circle of sorts. This ultimately stems down to more mainstream US sports being so ingrained in American culture that young, upcoming athletes will not even consider taking up a fringe sport such as rugby - made worse by the fact that it is so hard to actually find a team. This situation is gradually changing, but it's a slow process, and I think it will be at least a few decades before rugby really manages to nudge its way into mainstream American culture. Thank you for your comments and feedback on the issue of Rugby in the US. It's nice to get the perspective from someone in another country where it is more popular. You make some very good points. I have seen some college teams and tournaments starting up here in the US, but there is no comparison to the pros from other countries. Like you mentioned, I think it will take time for Rugby to gain popularity in the US. i have a question. if the 2 greatest and most entertaining to watch teams in the world THE ALL BLACKS and the wallibies came to your town would you pay $60 for a ticket? Personally, I would like to see the game, but I'm too cheap to spend that much on a sporting event. I would scrounge up money any way i could to go see that match.